In Eager, environmental journalist Ben Goldfarb reveals that our modern idea of what a healthy landscape looks like and how it functions is wrong, distorted by the fur trade that once trapped out millions of beavers from North America’s lakes and rivers. The consequences of losing beavers were profound: streams eroded, wetlands dried up, and species from salmon to swans lost vital habitat. Today, a growing coalition of “Beaver Believers”―including scientists, ranchers, and passionate citizens―recognizes that ecosystems with beavers are far healthier, for humans and non-humans alike, than those without them. From the Nevada deserts to the Scottish highlands, Believers are now hard at work restoring these industrious rodents to their former haunts. 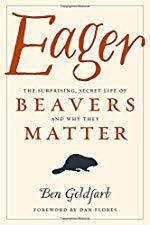 Eager is a powerful story about one of the world’s most influential species, how North America was colonized, how our landscapes have changed over the centuries, and how beavers can help us fight drought, flooding, wildfire, extinction, and the ravages of climate change. Ultimately, it’s about how we can learn to coexist, harmoniously and even beneficially, with our fellow travelers on this planet. This is a book very much in the same vein as "Coyote America" In that it is a surprising look at the human story behind the extirpation of an animal, that we probably shouldn't have been killing. The beaver's story is more complicated than the coyotes however, in that the myths surrounding the beaver are less about our relation to other humans, and more about the relation to our environment. Turns our beaver's dams are more than a nuisance, but a really really good thing, and a lot of our problems in now beaver-less areas could be solved if we let the industrious rodents back to do their thing. The author of Coyote America, Dan Flores wrote the introduction to this book and I hope between the two of these authors we have many more in depth animal/ecological histories to come. You'll never look at a beaver the same way again.